Smart bracelets are like any other jewelry, incorporating the features of both smart watches and smart bands. Smart bracelet looks are more female oriented, suitable with dresses and occasions. Smart bracelet is advancement in smart wearable industry, making its debut through the collaboration of Intel and Opening Ceremonies, named as Mica (my intelligent communications accessory). Smart bracelets have embedded semi-precious stones, snakeskin, pearls, obsidian and more to enhance looks and fashion. Smart bracelets such as Mica does not require connecting with smart phone, instead they communicate both ways using 3G cellular radio that provides alerts and notification on the screen. Smart wearable market is expanding at a rate of 18.7% annually, along with impacting positive growth of smart bracelets. Smart bands and smart watches are the competitors of smart bracelets, which are available at reasonable prices, looks and incorporating all the features of smart bracelets. Goldstein Research analyst forecast that the global smart bracelet market size is set to reach USD 168 million units by 2025, growing at a CAGR of 15.7% over the forecast period. The technological advancement, fashionable looks, number of smart actions available, personal disposable income, among others are some of the factors affecting the growth of global smart bracelet market. 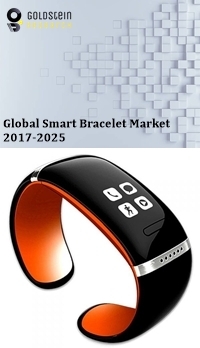 The report covers the present ground scenario and the future growth prospects of the smart bracelet market for 2017-2025 along with the global sales and global revenue of the smart bracelet. We calculated the market size and revenue share on the basis of revenue generated from major players across the globe. We have forecast the market on the basis of smart bracelet manufacturers, component manufacturers, suppliers and distributors, demand and supply, smart wearable industry, fashion industry collaborations. On the basis of product type, with screen bracelets accounted for largest market share of 58.3% in 2017. The convenient access of multiple functions is higher in screen bracelets than without screen smart bracelets. Smart bracelets incorporating health and fitness sensors demand is graciously growing at a rate of 13.4% annually on the back of rising health and wellbeing consciousness among all classes of people, since counting on fitness has become easy with the use of smart wearable. Smart bracelet market outlook 2017-2025, has been prepared based on an in-depth market analysis from industry experts. The report covers the competitive landscape and current position of major players in the smart bracelet market. The report also includes porter’s five force model, SWOT analysis, company profiling, business strategies of market players and their business models. Global smart bracelet market report also recognizes value chain analysis to understand the cost differentiation to provide competitive advantage to the existing and new entry players. Global smart bracelet market is experiencing the trend of using precious and semi-precious stones, precious embellishments like snake skin, tiger’s eye and others in order to make the smart bracelet look more fashionable. These bracelets have been promoted through fashion shows such as Mica was showcased in Fashion Week, New York. There is an impulse among top vendors and technology developers to include the smart wearable as a part of people daily living, instead of treating it as a technology device. Thus availability of smart bracelet as an ornament for daily life is one of the driving factors for the growth of smart bracelets among women particular for the fashion and accessories. Smart bracelets currently in the market are made of metals such as gold that acts as a barrier in the transmission of cellular network. Thus metal requires to be made of thin sheets, compromising the durability and strength of the product. Based on geography, North America accounted for largest market share of 36.2% in 2017 of the total global smart bracelet market. Presence of both large players and consumers of smart bracelets in this region are the major factor impacting the growth of North America smart bracelet market. South Africa is the opportunistic market for the growth of smart bracelets, as they are embellished with precious and semi-precious stones and other materials like tiger’s eye, available from South Africa. Global smart bracelet market report comprises of the following companies as the key players in the smart bracelet market: Intel, Swarovski, Fitbit, MEMI. What is the revenue of smart bracelet market in 2016-17 and what would be the expected demand over the forecasted period?